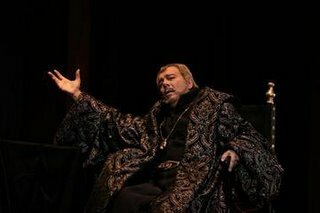 Ferruccio Furlanetto as Philip II. The first great production of the 2006-2007 LA Opera season arrived this week in the form of a new production of Don Carlo directed by Ian Judge and conducted by James Conlon. In fact it was so good it almost made me forget about the half-baked Traviata a few days previously. Don Carlo was not quite as star-studded as La Traviata, but definitely made up for this in the "action-packed" department. Judge seems to be going through a phase of what euphemistically might be called "period minimal" stagings. They are neither exactly traditional nor avant-garde. They often seem simple and designed to be inexpensive, but are often very effective and dramatic at the same time. Typically, the sets involve several small repeating units that can be moved and shuffled into various arrangements like building blocks. Judges' 2005 Romeo and Juliet consisted of an erector-set style Barbie Dream House that at various times opened, closed and/or rotated in different positions. This time around it was all about arches. The arches were set in separate tall wall segments placed at angles to one another that could move forward or retreat as needed. Add the occasional column, table or 10 ft crucifix and voila instant church, bedroom, or courtyard. The wall space above each arch contained segments of original Caravaggio-inspired paintings of suffering and frequently bloody martyrs and religious figures. These ever-present images were effective in maintaining an appropriate dark and foreboding mood throughout all the proceedings. What made these sets most interesting to me, however, was the movement. While this 3 and 1/2 hour opera was staged almost entirely on a single set, it never became boring due to the set movement, which would create different configurations in the honeycomb of arches while emphasizing different aspects of the paintings on the upper part of the set. At the same time, none of this was glaring enough to distract focus from the performers and the music. Salvatore Licitra as Don Carlo with Annalisa Raspagliosi as Elisabetta. Needless to say, this was a rather stark and somber affair. Of course this was abetted by the fact that the strongest vocal performances were in the hands of the “bad guys.” Dolora Zajick’s Eboli was great as was Ferruccio Furlanetto whose peformance made the opera seem a little more Philip II than Don Carlo. The real star of the show though was James Conlon and the LA Opera orchestra. This is the third performance of a major Verdi work I have seen him guide this year and I can’t help but be impressed. As with the San Francisco Symphony's performances of the Requiem this summer, the score was propelled with a life all its own and really seemed to be working hand-in-glove with the onstage drama. No small feat given how rarely these concurrent activities are associated in most modern American opera stagings. Which brings us to Don Carlo himself, Salvatore Licitra. This is the fourth time I’ve heard Mr. Licitra perform and I continue to be at a loss as to how he has maintained a headlining career entirely off of that last-minute-cover-for-Pavarotti story. Granted, this was the best performance I’ve heard him give yet. However, this may also be due to the fact that I had splurged and sat close enough to actually be within range of his voice. This isn’t all bad news though – he was good enough to officially fall to number two on my list of least favorite tenors right after Franco Farina. Still, I enjoyed the production enough to justify a second visit later this month. If this is where LA Opera is headed under Conlon’s musical guidance, it will be a great ride. Well sports fans, I’m off to San Francisco this week for Matthew Barney, Deborah Voigt, Thomas Mann, and les huitres, the real San Francisco Treat. See you soon.